Beams of light from medical lasers significantly lighten or even completely remove the tattoo. The ink particles in the tattoo absorb the light from the laser. When this happens, the ink particles are broken up into fragments that are then absorbed through your body's immune system. This process can take up to several weeks. Depending on the size of the tattoo, more sessions will be needed to break down the ink particles to remove the tattoo. Laser treatments are the safest option, being minimally invasive and only targeting the ink in the tattoo. Lasers are now the modern standard for removing tattoos. Before medical lasers, methods included cryosurgery, dermabrasion, or excision. These methods were painful and often resulted in scarring. Immediately after treatment, the skin will have some white discoloration and may appear red and swollen. This is completely normal and will go away over time. Antibacterial ointment and gauze will also be applied to the area to prevent infection. Results will start to show after 5 weeks. 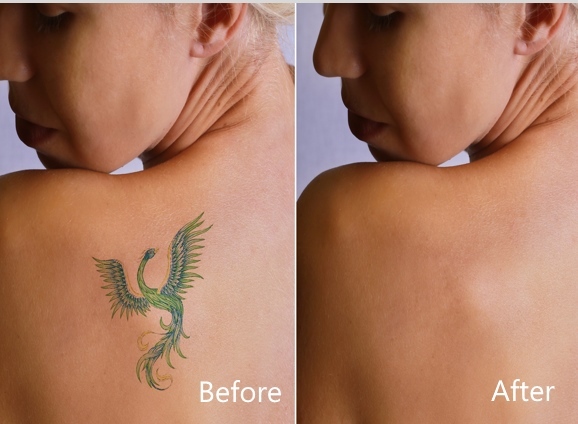 The number of treatments required to remove the tattoo will depend on the size, location, depth, and color of the tattoo. There should be 4 to 8 weeks in between each treatment to allow the body to heal while it removes the maximum amount of ink. Sometimes, whitening of the skin can occur. Skin-tone will return to normal within 6 to 12 months following the last treatment. The ink that is used for tattooing can vary, meaning some people might not see the tattoo completely disappear. Most patients say the treatment feels like a slight string on the skin. Usually, treatment does not require anesthetics. However, some patients may feel more comfortable with a topical anesthetic that numbs the skin. Each session lasts 10 to 30 minutes.